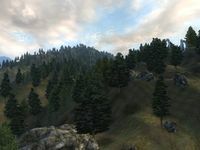 Colovian Highlands is the plateau on the western edge of Cyrodiil. 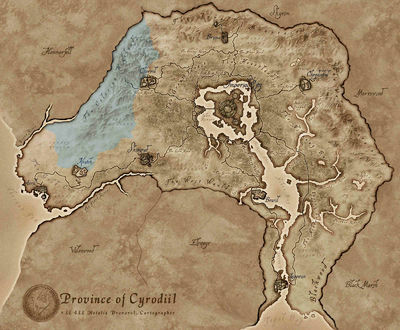 The borders of Hammerfell lie to the west. The Black Road extends a short way into the region from the eastern border. The regions of Gold Coast and West Weald border on the south, and the regions of Jerall Mountains and Great Forest on the east. Vegetation in the region is sparse. There is a reasonable concentration of Mandrake along the border with Hammerfell, some Clouded Funnel Cap to the north, plus Motherwort and Viper's Bugloss in the southwest, but apart from those the highlands are an area of bare rock, wispy grass and light forestation. A list of places found in the region of Colovian Highlands. Imperial Reserve — The grasslands west of the Great Forest extending as far as the Gold Coast. Black Road — Main road from the Imperial City to Chorrol. A list of all quests involving the region of Colovian Highlands. Sanguine: Crash a dinner party at Castle Leyawiin by playing a prank for Sanguine. This page was last modified on 7 October 2018, at 18:48.